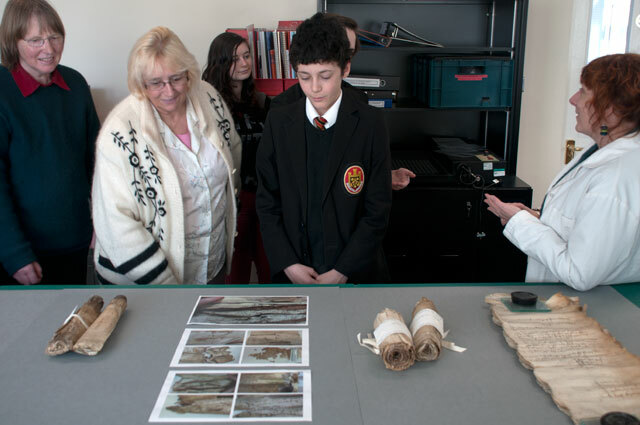 The idea of these sessions at Dorset History Centre was to have the volunteers think like an archivist. We heard from Cassandra Johnson, the Digital Archivist at Dorset History Centre, about what makes an archive. Exploring a key aim of this project – ‘What makes a usable archive’. How do we create a worthwhile and lasting archive? Thinking of the foundations of an archive, what can we do now, what can we build into the project from day1, into everything we do while collection data. In particular I’m thinking about the collection of metadata – how this is vitally important. Volunteers also got a chance to look behind the scenes, hear about the work they do to restore old documents and venture into the climate controlled vault where the archives are kept. Feedback to these sessions has been very positive, with people expressing amazement at the fantastic resource of Dorset History Centre. With most saying they aim to come back again and explore in greater depth the rich archives held here. Below is the result of our workshop session at Dorset History Centre, where we looked at what makes an archive and explored the term ‘metadata’. The session saw the younger and older volunteers work together to think through a list of keywords we should collect with each oral history interview. From the two sessions we held we have amalgamated the groups list of necessary metadata we should aim to collect. 1. What metadata do we need to record to make the Free Time project recordings useful? 2. How will this information be gathered and stored?